Flying Boeing 737 Next Generation aircraft in the Last Frontier has its challenges: inclement weather, remote locations, the occasional seal or caribou occupying the runway. But with over 86 years of flying experience, we’re pretty adept at meeting challenges. This is especially true when it comes to making sure our aircraft are maintained with a focus on safety and performance. To meet the rigors of flying in Alaska and beyond, we unveiled a brand new Maintenance and Engineering Facility in Anchorage, Alaska this week. The $50 million state-of-the-art building more than doubles the size of our original ’50s-era hangar. The old hangar is also unable to accommodate the Next Generation aircraft currently flying in the state. This means maintenance and engineering (M&E) personnel have been forced to work outside in the elements for routine maintenance and repairs. The new facility, spanning 100,000 square feet, will be able to house two of our largest aircraft in a covered and controlled environment. “Our existing facility has served us well for many years. 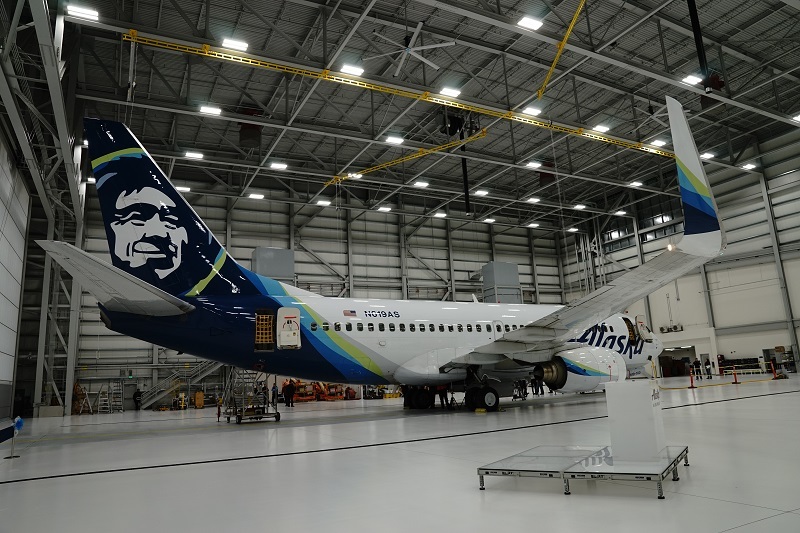 But as we grow and add larger planes to our fleet, the time was right for us to upgrade our northernmost maintenance facility,” said Kurt Kinder, Alaska Airlines vice president of maintenance and engineering. Alaska Airlines CEO Brad Tilden and VP of M&E Kurt Kinder present a $50,000 donation to Mike Hoffman, Yuut Elitnaurviat executive director. The new hangar is part of our “2020 Great Land Investment Plan,” an investment of over $100 million across the state of Alaska. This plan includes updating and, in some cases, expanding 11 airline-owned terminals as well as adding three 737-700 Next Generation freighter aircraft to our fleet, which will improve the ability to serve cargo customers’ needs with scheduled freighter service. At the hangar’s grand opening, we presented a $50,000 check to Yuut Elitnaurviat for their new Airframe and Powerplant (A&P) School in Bethel, Alaska. This donation will help support the training of future aviation technicians, with the first cohort of students starting at the A&P school in February 2019. The new hangar is a LEED (Leadership in Energy and Environmental Design) certified facility and designed to meet our fleet additions for the next 30-50 years. It will house over 80 employees, including those from M&E and Stores, and will become our new regional headquarters for the state of Alaska. We’re the largest passenger carrier in Alaska with 126 peak season departures and 19 destinations throughout the state. The new hangar measures 100,000 square feet, twice as big as the existing Anchorage maintenance hangar. The new hangar will be able to house two Boeing 737-Max 9 aircraft, which will be the longest/widest planes in our fleet. Built in 1954, our current Alaska hangar was originally owned by Northern Consolidated Airlines and designed to accommodate Douglas DC-3 aircraft. Over 500 Alaskans built the new Maintenance and Engineering Hangar. In addition to the Anchorage hangar, we have a maintenance hangar in Seattle. 7 comments on "New Anchorage hangar built to house two of our largest 737s"
This is our favorite airline. Helpful, courteous, and dependable. We fly Alaska whenever possible. They have partnered with several others and makes it even better for our European trips. Thank you. We are looking forward to an Everett to Great falls expansion flight. We are member’s of Saga points etc. Did my time in the Coast guard up there. Despite all of the airline’s expansion it is nice to see Alaska Air continuing to invest in their namesake community! Saw this in the news earlier this week. Hope to fly down to Seattle soon with Alaska. Wonder if Wolfgang Smidt still is a mechanic with the airlines. Like your customer/shareholder involvement. Keep up the good work.